The flaming ax from the Destiny: Rise of Iron trailer caught my attention pretty immediately. I don't think I have moved from seeing a prop to working on it so quickly, it was less than 24 hours from seeing the trailer to having materials and starting work. This prop took 3 months of really pushing to work most of my free time to get done for the Rise of Iron release. This project came with a lot of issues ( as flaming 5 foot tall axes normally do). I needed to find a way to make this thing look like it was on fire, and also break it into parts to fit into a suitcase to fly to PAX. To try and tackle those problems I decided to break the haft into several parts that screw together, and have the head of the axe be hollow with adressable LED lights to give a flickering fire effect. The first step for this build was to create a life size layout using the few available reference images (The best ones were here). I used PVC pipe to create the handle with screw connectors from the plumbing section of the hardware store. The male end was a metal pipe piece that was entirely threaded, while the female side was a PVC pipe fitting that fit the threads that I ground down to fit inside of the main pipe sections so they would fit flush. I also decided to make the end spike out of wood, knowing I would probably want to rest this thing on the ground often. I also decided to try and keep weight and build time down I would do the rest of the detailing on the handle out of craft foam. The spines on the bottom were created using three layers of eva foam, a 3mm layer with two layers of 6mm on either side. Eight of those fit perfectly around my pipe. Here I have the 8 mace parts carved out with my rotary tool and placed on a board to be sprayed with plasti-dip. When I made Link's shield from Wind Waker I has some problems with the plasti-dip pulling off of PVC pipe parts even after them being sanded, so I decided on this build to spray plasti-dip on all of the foam parts separately and then glue them in place. Putting them on the board with tape was partially to keep them from moving everywhere as they were sprayed, but also to protect the back part that connects to the PVC from getting any plasti-dip on it. If There was a layer of paint or plasti-dip between the foam and PVC the glue would really just be holding the plasti-dip layer on instead of having a firm connection to the foam base. Here are the plasti-dipped foam pieces glued in place on the PVC pipe and wood spike that fit into the bottom of the pipe. 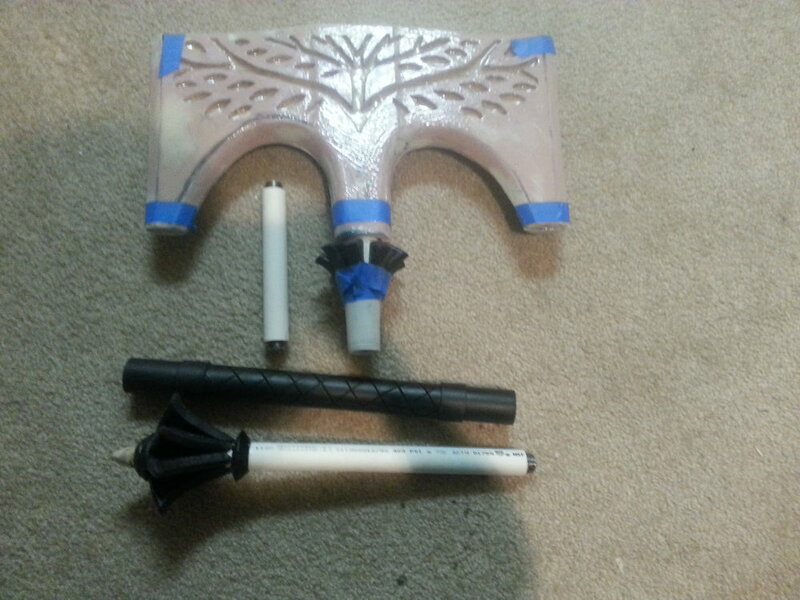 On the left you can see my full scale mock up of the piece with the various pvc parts laid out. On the right is a better view of the next few steps. The axe had a tapering section between the haft and head, so I layered on epoxy putty and sanded it to the right dimensions with a large section left of pvc pip left on top to be set and glued into the foam of the axe head. You can also see in the right image the basic cut outs for the matching mace section at the top of the haft, I didn't take photos of it but the bottom mace section started out the same way. I played around with several ideas to get the combination of complex shapes and hollowness I wanted for the head of the axe. My first attempt was shaped acrylic sheets with eva foam over it, that was a horrible combination of too heavy and unstable. After that I moved to a similar idea using sintra in place of foam, but that didn't allow for the transition from the blade sections to the chain wrapped section. Finally I saw Jechts cosplay (who is amazing, go follow him!) working with epsilon covered pink rigid insulation foam with the back carved away and decided to move forward with that. Knowing I would want an even shape, but to cut it apart later I used regular school glue to sort of tack two pieces of one inch foam together so I could cut and carve both halves, and then easily take them apart to resin and then hollow out on the back. Working in two halves also had the added benefit of allowing me to do resin layers on both sides at once without haveing to chase drips back and forth as I turned the piece. Here you can see the axe taking a more final shape. The first step to carving like this is using a knife to take off the bigger areas roughly. In this case the corners were cut off in the areas that could be the blades and basic rounding on the area that would attach to the haft. After that it is all sanding. I used a cheap 1/4 sheet sander from Harbor Freight with 120 grit (my favorite grit) to shape the large and more flat areas evenly and then went in and hand sanded everything until I was happy. Use a mask, you don't want to breath this stuff, wear an apron because the foam dust is staticy and clingy once sanded. Dryer sheets are great for getting the foam pieces less static so you can kind of clean up. Take note of the copy of the full scale mock up in the back with the tree details cut out, it is important for the next step. I transferred the design for the cut out pieces onto the foam on both sides using the full size mock up from before. I melted the design into the foam with a crappy wood burner and some wax carving tools heated on an alcohol lap (that's just an easier method for me, but probably not for everyone). At first i tried to fight getting any texture on the inside of the cut outs, but then decided it might enhance the 'inner flame' effect so I calmed down on insane sanding in tiny carved spaces. The two halves were then pulled apart to have epsilon applied, I used a knife slipped into a gap in the seam and then just worked it gently around the edge until they came apart. For me the white glue had actually not dried all the way through after several days so it made getting the sides apart and cleaned up easier. Since I don't have a garage, and the desert weather can do weird things to resin reactions, I set both pieces up on a plastic covered surface (read an unopened floor mat set because it worked) and would coat them outside, and then bring them in to my more temperature controlled apartment. Shout out to my roomate for dealing with this BS! I missed photographing the next few steps, honestly grabbing my phone or camera becomes low priority when covered in dust or resin. For the head of the axe I did multiple passes of smooth-on's epsilon (their directions are great so I won't go over that). I really recommend using epsilon, but resin choice is up to you. Always test on a scrap piece of foam to make sure you don't melt your foam work so far! After that is was sand, more resin, sand, resin layer, more sanding until I was decently happy with the smoothness and hardness of the coat (from my experience while epsilon is hardened enough to work with quickly, the true hardness takes about a week to show). I then filled in any areas that were very uneven with bondo and sanded that smooth. You can also see in the above images that I added the textured sections to the haft out of foam and sprayed it in plasti-dip. To create this I followed WM Armory's really amazing tutorial. Forgive my very rough sketch in place of a photo. After getting the outside mostly where i wanted it I focused on carving out the inside of the foam shape to make room for the electronics and lights as well as to remove the foam underneath any of the carved portions so the translucent epsilon coat could let the lights shine through. Again this step was a lot of trial and error, I had a basic setup of my lights at this point so I could at least test if they would show alright. On the carved parts there were lots of inconsistencies in how much resin had pooled into each, so I had to sand some down and add more resin when I broke through. To create flat backless sections of resin when I broke through, I used masking tape inside the axe and then added more resin from the front. Next up was finalizing the lights and making sure it all works right since my plan involved permanently setting in the lights with only the battery pack accessible. You can see the cut out section that opens in the above picture. All of my lights and electronics were purchased from Adafruit, I used two strips of neopixels and their trinket micro controller (I suggest getting the book learning pack) with a battery pack for 3 AA batteries. In hindsight I am not convinced that battery set up was the best, it lasts about 4 hours and I probably could have worked in a rechargeable or at least larger battery. I am not going to attempt to talk about how to get the lights set up, I followed several really useful guides and tutorials from Adafruit which do a far better job of explaining everything than I could. To make the flickering effect I took several arduino codes for flickering and fire effects, mashed bits together and then changed the colors until it looked good to me. HERE Is the code I used, if it is useful to you. With the lights working and hot glued into place inside the awe it was time to get the two halves back together (the ultimate on again off again relationship). I used two part epoxy to glue them together, and then used bondo to fill in any gaping and then a final layer of resin on any parts that weren't smooth enough on the edge. I used tape and garbage bags to keep the open section of the axe from getting any dust in it. The small foam piece that I cut off for the battery pack got velcro attached to it, as did the battery pack and the inside of the channel for it to sit in. It works as an attachment and makes getting the battery pack in and out easy, I also knew I was going to cover that section in wrapped chain so looks weren't a factor. You can see in the above photo that the other parts have begun getting their base paint layers. To help push the fire effect further I used Krylon stained glass spray paints in yellow, orange and red layered overlapped randomly on the sections that the light shines through before moving to final paint. While I like this look I found later that the led light colors can show through silver spray paint as well, so for a more subtle look when not lit using your silver color directly should work. Again the battery and wiring were open so I made sure to cover the hole with tape and bags. After the translucent color coats I decided to do the laziest masking I could think of, and basically dripped masking fluid (use a brush you are willing to throw away) into all of the carved parts and pushed it around until everything was covered. My detail work on this was all done in acrylic. I weathered in a warm black, brown and a rusty color in a few spots. Since these are sort of magical items in game I didn't want to make them look too grungy so I focused more on the highlighting. Every edge on the axe head was dry brushed with a very bright white silver color, and the gold parts got a similar treatment with a brighter gold. I used a darker and lighter silver color layered and dry brushed along the hypothetical cutting edges to make them look like they have been ground or sharpened in their lifetime. I also painted the chain I used on this, which I do not recommend and had to replace after the first con because the gold flaked to show the highlighter orange plastic chain below. This actually has several sections of chain, the portions that wrap over the top and connect to the top few wraps on the bottom, which is glued in place, the bottom few wraps which are also glued in place, and then a section that can be uncoiled over the battery cover and is connected by a hidden link. A good view of the axe broken into parts as well as the battery cover. It is hard to catch in photos, but I love how the brushed effects turned out, and the color of the dark bronze on the haft instead of a straight black makes my heart flutter. You can also see the connectors well in the above pictures. And then you're done! Welcome to the Iron Lords Guardian!